Drain clogs always occur at the most inopportune times. Fortunately, Cape Shore Plumbing, your local drain cleaning business, is available day and night, weekday, weekend and holidays when clogging problems occur. No job is too big or too small for our rapid response drain cleaning service. Whether a residential home or commercial business, you can always expect,, prompt and professional drain cleaning services every time you make the call to the friendly, professional plumbing team at Cape Shore Plumbing. Do you have a clogged kitchen, bathroom or laundry drain? Are you in need of a prompt, cost-effective local plumber who will respond rapidly to your call for drain cleaning, so that you are not the victim of stinking, germ-infested drain and sewer backups? 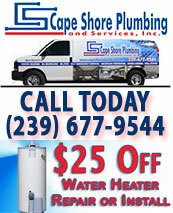 Cape Shore Plumbing, is proud of the fact that it is the best drain cleaning business in SWFL. Its licensed and insured expert plumbing technicians are on call 24 hours a day, 365 days a year, and will respond immediately to your call for plumbing drain cleaning help. Everyone associated with our company works hard to maintain our reputation for quality customer service. From the time we answer the phone to the time we've resolved your drain cleaning problem, your satisfaction is our first priority. We are proud to be the kind of plumbing contractor that our customers rely upon, and they prove it by calling again and again to fix their different plumbing problems. Your family is our family, and we are committed to providing you with excellent drain cleaning service. and other plumbing services. Our customers also know that we strive to perform to their complete customer satisfaction, and provide guarantees for our work. When you find yourself with a clogged drain and you need to avoid the resulting unsanitary, foul-smelling result of unattended drain clogs, Call Cape Shore Plumbing. Catch basins and storm drains, vital to preventing flooding in your home, reroute water from rain, floods and other ground water away from your home or commercial property into the sewer system. They also funnel away harmful debris like leaves, paper, rocks and trash that are a constant threat to your drain and sewer system. 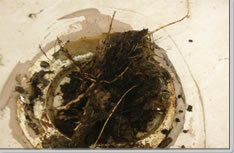 Sewer drain cleaning should be promptly and professionally performed on a regular basis. As soon as you suspect a clog in your main sewer line, it is imperative that you call Cape Shore Plumbing to inspect the lines and ascertain the location and severity of the problem. Camera inspections are performed quickly and easily to pinpoint the location of any problem areas in your home or business drains. Excavation of your property is no longer necessary to find clogs with this fast, effective method. High-pressure water jetting clears the clog and debris build-up in your drains leaving them completely clean. 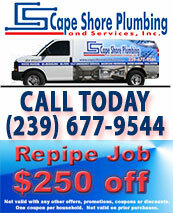 Do you need a plumber that knows how to Unclog Drains? (239) 677-9544. 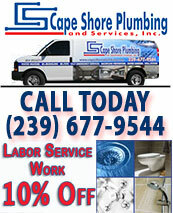 Because its plumbing team not only provides the best drain cleaning services in SWFL, it guarantees its work. Once you’ve made the call, you’ll rest easy knowing that you’ve made the best and only decision for all your drain cleaning problems. Your family is our family and we are committed to a service of excellence and customer satisfaction.